Programming in the public library is no easy task. Programming and then being forced to justify everything we are doing in the program can be downright exhausting. As librarians, there are many factors that can inform our instruction, including information literacy standards, patron needs, and patron interests. After determining the topic or focus of a program, it can be tempting to jump right into the planning of an activity. Sometimes we create great programs this way. However, this method may not allow our programming to reach its greatest potential. What will improve programming the most is taking the time to decide exactly what students or participants will leave the program with (tangible or intangible) and how we will know that they have reached our goals. Making use of backward design in the program planning process will not only prepare us to answer any of the questions above, but it will also enhance the quality of programs, in addition to helping us grow as instructors. Backward design was first introduced by Grant Wiggins and Jay McTighe in their 1998 text, Understanding by Design. Backward design is a framework for instructional design composed of three stages. The first stage involves determining the desired results of a lesson. In this stage, the instructor determines what they would like for their students to gain from the lesson. The second stage is all about assessment. The instructor identifies what will indicate that students have achieved the desired results. Any and all evaluation is developed during this stage. The third, and last, stage is devoted to what will occur during the lesson. It is in this stage that the instructor plans the activities, resources, and methods of the lesson—the experiences through which students will gain the understanding and knowledge to achieve the desired results. Based on this structure, the goals of a lesson will inform the development of assessments and experiences. Thus, instructional goals remain at the center of the process (Wiggins & McTighe, 1998). Backward design is a logical framework for instructional design, so it may seem strange that the word “backward” is part of its name. Backward can imply that this method is counterintuitive or confusing. However, that is not the case at all. Rather, according to Wiggins and McTighe (1998), “backward” merely addresses the fact that many instructors build lessons from the beginning around a beloved book or favorite activity instead of selecting those resources based on defined goals. Backward design calls for teachers to begin with the end, and then move backwards through a lesson by identifying desired results, developing the assessment, and then making a lesson plan. Considering assessment before actually planning a lesson is another justification for the term “backward” (Wiggins & McTighe, 1998). It can be easy to consider assessment at the end of a lesson, but there are several benefits of making decisions about assessment, based on evidence of student learning, at the beginning. Contemplating these things can help clarify goals and define teaching, which ultimately leads to greater student performance (Wiggins & McTighe, 1998). While it’s unlikely that anyone will ask to see formal lesson plans for your programs, writing down your plans can help you organize your thoughts and can save you time later if you want to offer an old program again. To help you record these plans, we’ve developed a backward design template for public library instruction, which you can find at the bottom of this page. Step 1: What are my Desired Results? The first step of this backward design process is all about defining the desired results of a lesson or program. This is the stage in which we define where we are going so that we can decide how we will get there. It involves setting goals and defining essential questions. This section will discuss how to define goals and write essential questions, and then we will consider why doing these things as the first part of the planning process is valuable. Sometimes setting a goal can be easy; maybe we have plenty of information and indicators to point us in the direction we should be heading. As librarians, our goals may be informed by professional standards, learner feedback, previous experiences, or library-wide goals. Goals for a program can certainly come from any of these sources, but regardless of where the goal originated, what is important is that it focuses on the big ideas. According to Wiggins and McTighe (2005), big ideas can help establish the learning priorities, which can really focus the planning of a lesson. Indeed, it is easy to get caught up in all the exciting parts of a subject area but trying to cover too much information can lead to confusion and little learning. Wiggins and McTighe (2005) remind us that identifying the big ideas can help clarify goals in a way that helps us resist overwhelming learners with “everything of possible value for each topic,” which can be a challenge (p. 66). A misunderstanding about big ideas is that they really do have to be big, or, rather, broad. 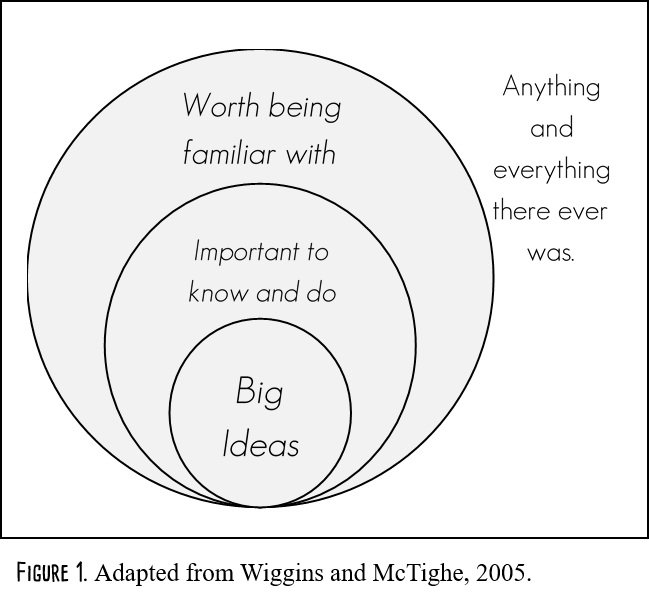 However, a big idea does not have to be actually big; it just has to be central to the topic. This means that the idea has significance for the past, present, and future. Wiggins and McTighe (2005) said it well when they explained that a big idea “must enable the learner to make sense of what has come before; and, most notably, be helpful in making new, unfamiliar ideas seem more familiar,” as a big idea serves as a “tool for sharpening thinking, connecting discrepant pieces of knowledge, and equipping learners for transferable applications” (p. 70). One way to think of a big idea for a lesson is to think of the spine of a library book; without the spine, a book would be a bunch of loose pages. The spine, however, not only reliably holds the pages of a book together but also gives information (author, title, shelf number) that will assist you in taking further what the pages have to offer. Wiggins and McTighe (2005) offered a very useful diagram (Figure 1, below) that can help narrow things down when defining big ideas and setting goals. This figure can be very helpful when trying to determine a topic’s big idea. Outside of the outermost circle would be all extraneous information about a topic. Within the largest circle are the words “worth being familiar with,” which would encompass anything about a topic that seems important enough for learners to encounter at least once during a lesson or unit. Next, we move into the middle circle, in which we find the words, “important to know and do.” At this point, the information and ideas from the largest circle are narrowed to everything about a topic that learners need to be able to connect and transfer knowledge, skills, and concepts from this unit to another. Finally, this brings us to the center-most circle, within which are the words, “big ideas and core tasks.” These ideas will “anchor” the program and represent the “heart” of the topic (Wiggins & McTighe, 2005, p. 72). This visual organizer can be a helpful tool for prioritizing content. Once you know what ideas and skills you want your instruction to focus on, it’s time to translate those into clear learning goal statements. These statements typically start with a phrase like, “As a result of this program, learners will be able to….” The word that follows this phrase should be an action verb that clearly describes what you want learners to be able to do with the knowledge or skills they gain through your instruction. Vague verbs like “understand,” “know,” or “learn” should be avoided. Action verbs should be appropriate for the scope and purpose of the instruction. For example, a verb like “list” might be appropriate for a program aimed at teaching learners insect facts, while a verb like “evaluate” might be a good choice for a program that asks participants to critically examine local food insecurity. There are many action verb charts online to help instructors write clear, manageable, and measurable learning goals; for example, take a look at this one from Fresno State University, which organizes learning goal verbs according to Bloom’s Taxonomy levels: https://bit.ly/1dLvANi. The table below contains some examples of poorly-written learning goals alongside improved versions of each. understand how to use the library’s online catalog. use the library’s online catalog to find fiction books of personal interest. write fanfiction. define fan fiction, choose a mentor text of personal interest and develop an outline for a fan fiction short story. learn about cyberbullying. develop a plan to prevent and respond to cyberbullying they experience or observe online. talk to a local author. write a question based on a local author’s book and pose that question to the author in person. How Essential are “Essential” Questions? The answer is: very essential! Essential questions are very helpful in framing content goals and, thus, are developed in close relation with the goals and desired results. True essential questions lie at the heart of a topic and may, in fact, define it. Because of this, essential questions can also be helpful for learners because they assist in connecting different facets of the same unit while also serving as a starting point for learners as they explore totally different topics. Essential questions cannot be answered in one simple sentence. Their purpose is not to give learners facts or basic knowledge about a topic, or else they would belong in the outermost circle of the diagram from above. Rather, essential questions should not be easy to answer. They should spark a learner’s thought and interest. They should provide possibilities and adventure related to the topic. Indeed, Wiggins and McTighe (2005) insisted that good essential questions allow us “to uncover the real riches of a topic otherwise obscured by glib pronouncements in texts or routine teacher-talk,” and that we must “go beyond questions answerable by unit facts to questions that burst through the boundaries of the topic” (p. 106). Essential questions look past right or wrong answers and seek “meaningful connections with what we bring to the classroom from prior classes and our own life experience … [causing] us to rethink what we thought we understood and transfer an idea from one setting to others” (Wiggins & McTighe, 2005, p. 107). Filter 1: To what extent does the idea, topic, or process represent a “big idea” having enduring value beyond the classroom? Filter 2: To what extent does the idea, topic, or process reside at the heart of the discipline? Filter 3: To what extent does the idea, topic, or process require “uncoverage”? Regarding the first filter, Wiggins and McTighe (1998) quoted Jerome Bruner to summarize the idea: “For any subject taught in primary school, we might ask [is it] worth an adult’s knowing, and whether having known it as a child makes a person a better adult” (p. 4). Determining the value of something for a child later in life can be useful in deciding what to teach. When considering the second filter, addressing the relevance of something within its discipline can also be useful. If something does not relate back to the heart of the discipline, it may belong in the outermost circle of Figure 1, not as an essential question. When thinking about the third filter, it may seem counterintuitive, but it is important to ask questions with which learners are likely to struggle. By defining an essential question as something learners will likely have difficulty understanding, they will, over the course of the lesson or unit, need to push through those struggles to answer the question. Easy questions may not contribute to learner growth. Lastly, the idea behind the fourth filter is that essential questions should promote learner engagement. By framing questions that address learner interests, it is more likely that learners will be engaged with the topic, and, consequently, their energy will be more sustained. It is helpful to use the essential questions to excite and motivate learning (Wiggins & McTighe, 1998). Setting goals and writing essential questions are parts of the first stage of the backward design process. In setting goals, the instructor is required to narrow down information to ensure those goals reflect big ideas. These big ideas should be focused and central to a topic and should help lead learners to discovery and inquiry into different topics. When writing essential questions, one must consider how a topic reaches outside the bounds of the classroom, how it is anchored in the center of a discipline, how the topic requires exploration into challenging territory, and how it can offer engagement for learners. Why do these things come first in the planning process of the backward design model? By defining desired results before doing anything else, the rest of the planning process can be guided by central ideas. Not only does this provide a point by which to check yourself throughout the process, but it can also increase the cohesiveness of all parts of a lesson or program. By starting with the end, with the results of a unit, you always know where you are trying to go. Because of this, you can be sure that your assessments and activities line up with the goals and each other. Step 2: I Have my Desired Results; How Will I Know They Have Been Achieved? The second step of the backward design process is all about assessment. Assessment and its many methods will be discussed in a Chapter 10 of this book, so this section is concerned with the placement of assessment in the backward design process rather than its practical execution. After establishing the desired results by setting goals and writing essential questions, it can be very tempting to jump straight to the third step by designing activities and selecting resources, before considering exactly how to evaluate learning. This is an impulse that we should resist, according to Wiggins and McTighe. Without considering and developing the assessment and what would serve as evidence of learning before the actual lesson plans, we increase the likelihood that assessments and activities will become disjointed and that the results of our assessment may not accurately reflect the learning that has occurred. Creating the assessment before the plan ensures the efficacy of both steps. Determining exactly what will be assessed before planning the lesson will ultimately make the third step (planning learning activities) easier because activities can be designed to satisfy desired results and expectations of the assessments (Wiggins & McTighe, 2005). Just as creating the assessment before the plan will help us produce better results as instructors, so, too, can establishing the desired results be helpful before creating assessments. Clear goals and good essential questions will help frame the assessment and performance goals. Determining how to evaluate learners or participants will be much easier after knowing for what you are evaluating. For an example of how backward design can help establish the what and how of instructional design, see the spotlight box below. Joey Feith is a physical education teacher at St. George’s School of Montreal in Quebec, Canada. His school held a professional development session in which teachers split up into groups to practice backward design skills. The teachers created plans to help students develop the “knowledge, skills, and understandings [the teachers] hope [the students] will have acquired by the time they graduate” (Feith, 2015). Feith found this exercise to be eye opening, and it sparked a personal development plan. In his blog, he wrote about the importance of becoming the best physical education teacher possible so his “physical education program will help [each student] effectively develop into a physically literate individual” (Feith, 2015). However, Feith discovered that he had no idea what his specific desired results were in the journey to become the best physical educator possible. So, he created a two-phase plan using backward design. In the first round of backward design plan, he would dream up the ideal physical education teacher (Step 1), create an evaluation rubric based on those goals (Step 2), and perform a personal self-assessment (Step 3). For the second round of backward design, he would set goals for professional development (Step 1), use the “Objectives and Key Results” evaluation method he learned through Google (Step 2), and then seek the professional development that would help him reach his goals (Step 3). While Feith’s work did not take place in a library setting, his example does show how public librarians might use backward design to develop an instructional growth plan outside of a traditional classroom context. Step 3: I Have my Desired Results and my Assessment Plan; Now, How do I Make it Happen? According to the backward design model, it is only after defining the desired results and creating the assessments that the actual lesson planning should occur. When beginning to determine what kinds of activities and resources to use for a lesson, it is important to make those decisions based on the desired results and the performance goals. You can ask yourself, “What should I do instructionally to meet these goals?” Wiggins and McTighe (2005) advise that the planning be catered toward the results of the first two stages, which will result in a lesson that is more about learning and less about teaching. The authors note that “regardless of our teaching strengths, preferred style, or comfortable habits, the logic of backward design requires that we put to the test any proposed learning activity … against the particulars of Stages 1 and 2” (Wiggins & McTighe, 2005, p. 192). In the following several chapters, we will explore instructional approaches and specific methods that you can use to help plan learning activities that reach these goals. Feith’s use of backward design [see spotlight box] is significant because he did not use it to plan a classroom experience for students. The goals of his plan did relate to the classroom because the goals concerned his success as an educator, but it is important to note that his plan had nothing to do with a classroom-taught unit. Backward design can be useful when planning for almost anything. In fact, once you become comfortable with the method, you may find that you can use backward design in very unexpected places. For example, say you have a friend whose birthday is coming up. In determining what gift to get her, you first think, “What would I like for my friend to gain from the gift I purchase?” Perhaps you would like for her to grow in the confidence of her uniqueness (Step 1). So, then you think, “What could I get her that would help her gain that confidence?” You determine that a good book should do the trick (Step 2). Finally, it is time to select the book that will help your friend’s confidence grow (Step 3). Indeed, Jessica Shyu, a program director for Teach For America, wrote a blog in 2007, “Life … in Backward Design,” in which she described how to find a significant other using backward design. She wrote that you should determine your dating priorities (Step 1), consider how a potential significant other can demonstrate that they meet your priorities (Step 2), and then decide what you could do to meet someone who can successfully demonstrate behavior that meets your priorities (Step 3) (Shyu, 2007). These lighthearted examples are meant to show two things. The first is that backward design may seem intimidating or challenging at first, but by using it, you will gain confidence and the process will begin to come naturally. The second is that backward design does not merely have significance in the traditional classroom. It can be a useful framework for planning any number of things, especially library programs. Why Does This Matter for Public Libraries? It is true that Wiggins and McTighe wrote about backward design in the context of teachers in a traditional classroom. However, backward design is highly applicable and useful in the public library. As instructors, we as youth librarians can adapt this design framework to make it most applicable for our setting, particularly when we consider the rise of the outcomes-based planning and evaluation (OBPE) process. Step one of backward design, identifying the desired results, is not a new idea for public librarians. With the growing popularity of OBPE, libraries have begun to emphasize the value of setting goals, or outcomes, before determining what your library will do to better serve the community. According to librarian educators Melissa Gross, Cindy Mediavilla, and Virginia Walter (2016), an outcome identifies a “positive change that occurs as a result of using the library,” and these changes may occur by “gaining a new or enhanced skill, acquiring a new knowledge, taking on a different or improved attitude, modifying one’s behavior, or improving one’s life status or condition” (pp. 31–32). In general, outcomes and goals are very similar. It is important to note that outcomes end in a particular result, whereas goals do not. Additionally, goals tend to be broader than outcomes. However, outcomes-based planning and evaluation, like backward design, calls for defining the result before diving into planning. Step two of backward design, defining assessment and evidence of learning, may seem like the part of backward design that does not belong in libraries. After all, children and teens do not come to the library to earn another grade. However, assessment is not synonymous with grades. Assessment in the library can manifest as any type of evaluation (see chapter 10 for a deeper exploration of what assessment might look like in a public library setting). In addition, as noted by Gross, Mediavilla, and Walter (2016), program evaluation can often occur after it has completely ended. Perhaps someone will remember to collect some evaluating data, but that will not necessarily be the case. This seems odd when considering that evaluative data will confirm the good work being done by the library (Gross, Mediavilla, & Walter, 2016). Because “library programs are the mechanism by which outcomes are achieved, [and] evaluation is the means by which the effectiveness of those programs is measured,” the OBPE process asserts that the means of evaluation should be determined while planning programs (Gross, Mediavilla, & Walter, 2016, p. 53). The backward design method goes just one step further to say that evaluation should be determined before planning programs. We already know that step three of backward design, the planning of the lesson, is being executed, and executed well. Public librarians are designing very creative and exciting programs, and libraries are reaching many people in their communities through those programs. Backward design, and the OBPE process, can only make those programs stronger. By embracing these practices and using them to grow programs and services, we will better serve all youth in our communities. Sarah Kepple (2013), in an empowering article published in Young Adult Library Services, argued for the use of backward design and outcome measures when planning programs for teens. She noted that often, goals can be considered measures of accountability, but she asked, “what if we dare to think of them as targets that empower us to dream and act on that dream?” (p. 34). Kepple acknowledged that sometimes we may not meet our goals with a program, but that should not discourage us because it means we “just spent time, energy, and money on what is essentially research to help us meet our goals better” (2013, p. 36). She argued that while programs that focus on fun are wonderful, these just-for-fun programs have other valuable intended outcomes. By embracing backward design, we can produce these fun programs while focusing on other important goals because “ultimately, our [children and] teens deserve this level of thoughtful, intentional effort” (Kepple, 2013, p. 37). Click the images below to download a blank lesson planning template (left) and a sample completed template (right). Gross, M., Mediavilla, C., & Walter, V. A. (2016). Five steps of outcomes-based planning and evaluation for public libraries. Chicago, IL: ALA Editions. Kepple, S. (2013). Intentionally backwards: The future of learning in libraries. Young Adult Library Services, 12 (1). Wiggins, G. & McTighe, J. (1998). Chapter 1: What is backward design? In Understanding by design (chapter 1). Alexandria, VA: Association for Supervision and Curriculum Development (ASCD). Wiggins, G. & McTighe, J. (2005). Understanding by design (2nd ed.). Alexandria, VA: Association for Supervision and Curriculum Development (ASCD).